Combine 2 cups of flour, sugar, instant yeast, spices, and salt in a mixing bowl. Add warm milk, pumpkin puree, and oil, blending until mixture is combined and smooth. Knead in extra flour, a little at a time, until it forms a soft dough. Careful not to add too much flour or the rolls will be dry and hard. Will also add more as you roll it out. Cover and let dough rest in a warm place for 5 minutes. Meanwhile, combine coconut sugar with spices and set aside. Place dough onto a lightly floured surface and roll into a large rectangle. Spread softened butter generously over the surface of the dough and top with the sugar/spice mixture. Beginning at the long edge of the rectangle, tightly roll dough into a log. You can use a sharp knife, but I prefer to cut each roll with dental floss, which doesn't flatten them. To use floss, place long string of floss under the rolled dough and criss cross the ends to cleanly slice the roll into equal slices. Divide roll in half and then each half into six–seven equal portions, about 1 to 1-1/2 inch slices. Depending on how big your rolled out your rectangle, you may get more or less slices. Place slices into a 13x9 pan greased with butter or lined with parchment lined. Cover and let rise in a warm place for 30 minutes, or until rolls have almost doubled in size. If your kitchen is cold you can turn your oven on for a few minutes and then turn it off so that it is slightly warm inside. Should be warm and not too hot to touch. Place pan into the oven to rise (make sure it's turned off!) Close to the end of the rising time, remove pan and preheat your oven to 350ºF. Place pan onto the middle rack and bake for 20–25 minutes, or just until rolls are lightly golden around the edges and centers are puffed. Don't overbake. Remove and let cool slightly before topping with frosting. Makes 12–15 rolls. Blend together cream cheese, softened butter, maple syrup, and vanilla until creamy. Add a splash of milk if frosting is too thick. Spread frosting over warm rolls. Combine pumpkin puree, maple syrup, and pumpkin pie spice in a small saucepan and cook over medium–low heat until puree is smooth and thick, like pumpkin butter. Should only take a few minutes. Remove and let cool. In a separate bowl, blend together the cream cheese and softened butter. Beat in cooled pumpkin mixture a spoonful at a time until frosting reaches desired taste and consistency. Add additional spices and/or sweetener as necessary. Due to the pumpkin addition, this frosting will be easily spreadable and not too thick. 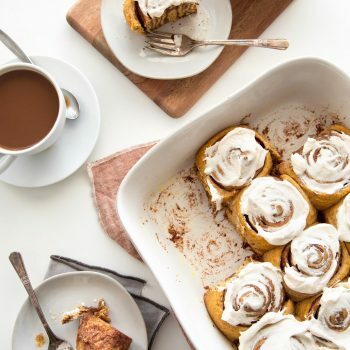 Slather frosting on warm pumpkin rolls.